The Cheung Chau Bun Festival is one of Hong Kong's major cultural events and takes place during a three week period, culminating with the Piu Sik Parade ("Floating Children Parade") and finals of the Bun Scrambling Competition on the 8th day of the fourth moon in the lunar calendar, which is also the Buddha's Birthday and a public holiday in Hong Kong. The festival, also known as the Jiao Festival has, since June 2011, been one of four cultural events in Hong Kong which have been placed on the People’s Republic of China Ministry of Culture national list of intangible cultural heritage. The festival is held in honour of Pak Tai, the Daoist deity and god of the north and is intended to purify the community and pacify the spirits of islanders who died in the plague of 1894. The plague was finally wiped out after Pak Tai’s image had been paraded through the streets of the island. 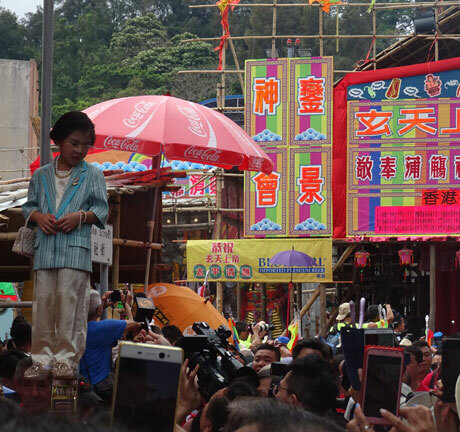 The 2019 Bun Festival is jointly organised by the Hong Kong Cheung Chau Bun Festival Committee and the Leisure and Cultural Services Department with the support of the Cheung Chau Wai Chiu County Association Limited, the Cheung Chau Rural Committee, the Islands District Office and the Hong Kong Mountaineering Union, and sponsored by Lukfook Jewellery, Watsons Water and the Islands District Council. Events run from 14th April to 13th May 2019. Until 1964 the festival was celebrated at Tung Wan (East Bay) Beach but since 1965 the focal point has been the Pak Tai Temple, one of Hong Kong’s oldest temples, built in 1783. The event has become a major attraction for thousands of visitors from Hong Kong and overseas and in recent years up to 70,000 visitors have joined the island’s 30,000 population during the festival period. 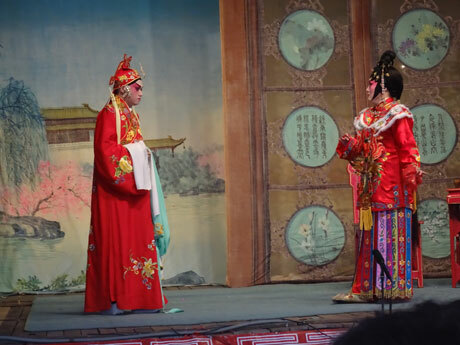 A makeshift theatre is erected opposite the temple for Chinese opera performances and other events throughout the festival include lion and dragon dances, martial arts performances and variety shows. Tradition dictates that for three days of the festival only vegetarian food is eaten with meat and seafood only becoming available after all the buns have been removed from the tower. However whilst visitors will find that restaurants take meat off the menu and McDonalds offers veggie burgers, the vegetarian tradition is nowadays mainly observed by indigenous islanders with many shops and food vendors cashing in on the tourist market. 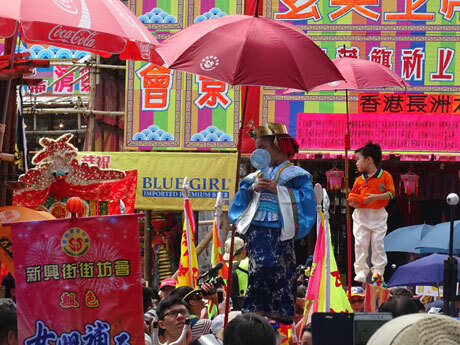 The main events are the Piu Sik (Floating Colours) Parade and the Bun Scrambling Competition which traditionally take place on the 8th day of the fourth moon in the lunar calendar (22nd May in 2018). The colourful street parade from 2pm to 4pm attracts huge crowds. At the 2018 festival, the number of visitors travelling to the island on the day of the parade and Bun Scrambling Competition was about 20,000, a decrease from about 25,000 the previous year, largely attributed to extremely hot weather. The parade features “floating” children representing revered gods and current political figures, and who are carried shoulder high, appearing to be unsupported in mid-air. The 2013 parade first broke with tradition by featuring a non-Chinese child in the parade in a concession to promotion of healthy eating when two British brothers, aged 6 and 5 depicted British celebrity chef Jamie Oliver and a farmer. The parade is accompanied by over 20 decorated floats, musicians, flag-bearers, gongs. 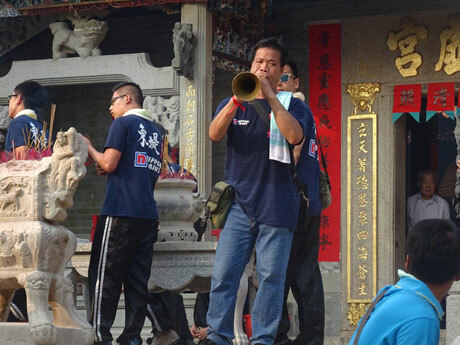 At the front of the procession red sedan chairs carry deities from all the temples on Cheung Chau, led by Pak Tai. The 2015 Bun Scrambling Competition was cancelled owing to adverse weather although the Piu Sik Parade earlier in the day did take place that year. Until 1978 the Bun Scrambling Competition had been a “free for all” but during that year’s competition one of the three bamboo towers collapsed resulting in injuries to over 100 people and the competition was suspended for 27 years and the buns handed out instead. In 2005 the competition was reintroduced but under strict safety conditions. 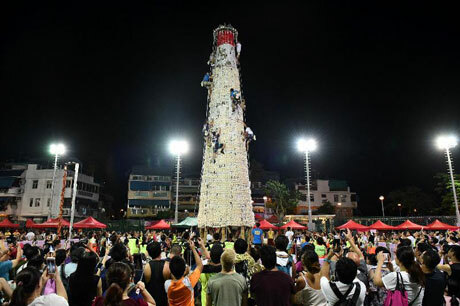 The three bamboo towers have been replaced by a single steel tower and the number of climbers is limited to twelve who undergo training from Hong Kong Mountaineering Union. 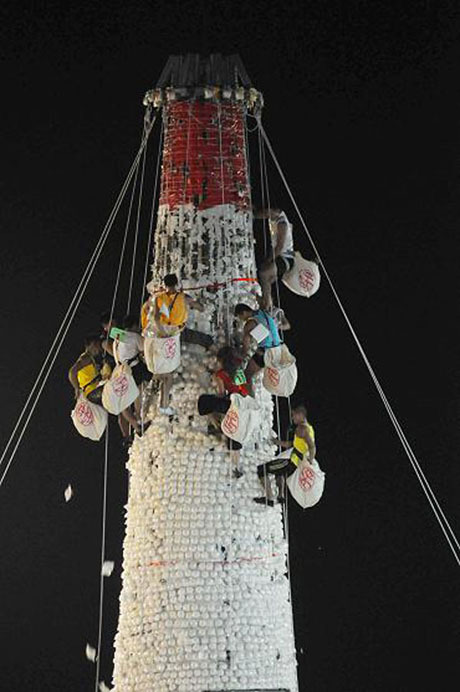 On the stroke of midnight the twelve participants race up the 14-metre tall, 3-metre diameter conical bun tower to grab as many buns as they can collect within the three minute time limit. The bun tower is divided into three zones from top to bottom and buns each carry a score of nine, three and one respectively. Words in green, yellow and red are printed on the bottom of the buns for identification. The scores for male and female contenders are ranked separately. The contestants who obtain the highest total score in three minutes are the champions. Trophies are awarded to the champion, first runner-up and second runner-up in the men's team event the champion in the women's team event and the winning teams in the Bun Scrambling Invitation Relay. The "Full Pockets of Lucky Buns" award is given to the participant who grabs the most buns. All contestants have to follow the rules of the competition. They are not allowed to carry any hard objects or any objects that can be used as offensive weapons. They must scramble up vertically and are forbidden to climb sideways or climb with the aid of others and are not allowed to pull other participants' clothing or safety gear or step on any parts of other participants' bodies. In order to increase the appeal of the event, a Grand Award has been introduced with effect from the 2016 competition under which any male or female athlete who has won first prize three times in the Bun Scrambling Competition will become the "King of Kings" or "Queen of Queens" of the competition. The real buns on the tower have been replaced by 9,000 plastic replica “buns” for reasons of hygiene. Redemption coupons are issued to spectators and these can be used to claim one of the replica buns as a souvenir with the remaining “buns” being cleaned and saved to be re-used the following year. The following day about 20,000 real white buns with lotus, red bean or sesame fillings, are made by local bakeries, each stamped in red with "Ping An" the Chinese character for peace, are handed out. In a further concession to public health precautions, at the 2011 carnival, the Food and Environmental Hygiene Department banned the practice of the local bakeries stamping the buns outside their premises and lack of space inside the bakeries resulted in a substantial reduction in the number of buns baked. However, since the 2012 carnival the Department has issued temporary licences to bakeries allowing tables to be set up outside their premises, where buns could be stamped with the message for peace. For the 2016 festival, for the first time on Cheung Chau a food processing machine was used speed up making the buns. The HK$400,000 machine, brought in by the owner of Kwok Kam Kee Cake Shop which produces about 60,000 buns each year for the festival, was manufactured by Rheon of Japan and can produce 20 buns a minute, double the number which can be made by hand. 14th April - 9am to 7-30pm - 200 climbers for the individual event receive training on bun tower climbing and from 10am to 1pm Bun Scrambling Competition Invitation Relay participants receive training on bun tower climbing from China Hong Kong Mountaineering and Climbing Union at Pak Tai Temple Soccer Pitch. * Admission to the Bun Scrambling Competition is by ticket only. Four spectator zones will be set up on the night at the soccer pitch of Pak Tai Temple Playground, which can accommodate about 1,650 people. 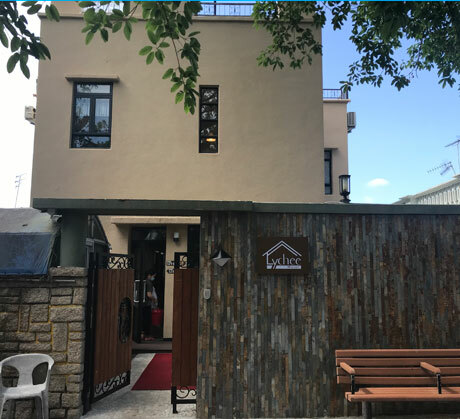 Members of the public are requested to queue up at Pak She First Lane, next to Cheung Chau Fire Station, and along Ping Chong Road to get free admission tickets. The distribution of tickets will start at 10pm. Each person can obtain one ticket on a first-come, first-served basis while tickets last. Spectators who have got their tickets should wait for instructions from the Police and staff of the organisers for admission, which is expected to start from 10.30pm. Spectators should enter Zone 1 to Zone 4 in sequence. Notices will be posted at Central Pier 5 informing the public of the schedule and arrangements of the event. Notices and enquiry counters will also be set up at Cheung Chau Ferry Pier and the entrance of Pak Tai Temple Playground, where staff will be on hand to address public enquiries. Organisers will monitor the weather conditions on the night. The Bun Scrambling Competition will be cancelled in case of inclement weather, including thunderstorms, to ensure public safety. As stipulated in the prospectus, awards would then be determined based on the results of the selection contest and a prize presentation would be held immediately. Since the Bun Scrambling Competition is traditionally held at a specified period during the Cheung Chau Jiao Festival, no replay of the competition would be organised in such circumstances. Cheung Chau is served by the First Ferry service from Central Pier 5 on Hong Kong Island, Maris Ferry Company service from Aberdeen Promenade on Hong Kong Island and also by the First Ferry Inter-Island ferry service which connects Cheung Chau with Chi Ma Wan and Mui Wo on Lantau Island and Peng Chau. Visitors intending to take the “Fast Ferry” service should arrive at the pier well before departure time. Passengers are counted on board and standing is not allowed. The “Fast Ferry” may leave before scheduled departure time if full. On 12th May demand will be very high and additional ferry services operate with the number of sailings increased to 5 or 6 per hour at peak times. 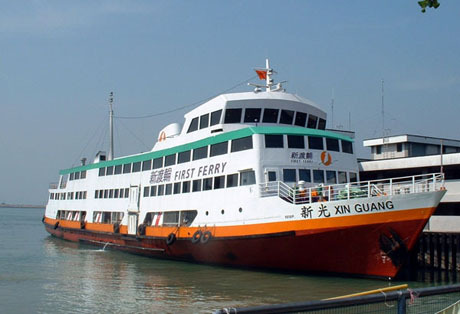 First Ferry operates an additional “Ordinary Ferry” service from Cheung Chau to Central at 1-15am , after the conclusion of the Bun Scrambling Competition. Bus companies will operate a special bus service of cross-harbour route 104R running from Central Pier No. 5 to Mong Kok from about 1-10am to 2-30am on May 13th. Overnight bus services departing from the Hong Kong-Macau Ferry Terminal will be progressively diverted via Central Pier No. 5 from about midnight to about 2-50am for passengers' convenience. These routes are Citybus' routes N8X (to Siu Sai Wan) and N90 (to South Horizons) and cross-harbour routes N182 (to Kwong Yuen, Sha Tin), N619 (to Shun Lee, Kwun Tong) and N368 (to Yuen Long West). PRAYA STREET ACCOMMODATION BOOTHS. Located outside the ferry pier entrance are several kiosks which are usually manned from mid-morning and often until about midnight. 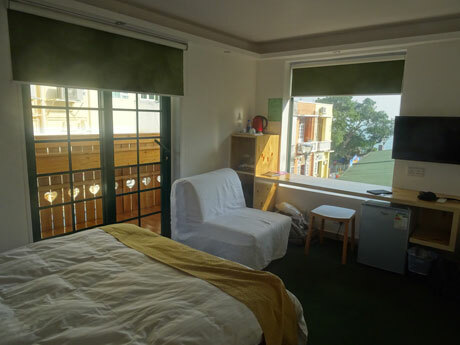 These are operated by various owners including Seaview Holiday Flats (see above) offering flats ands room with budget accommodation. Visitors can view photographs of the accommodation in display albums at the stands.